Spring is the ideal time to fill your window boxes with evergreen box, ivy and colourful primroses, daffodils or tulips. We have an excellent selection. The Ironwork window boxes shown was sent in by one of our US customers in Nashville, Tennessee who was delighted with the trio of custom made design. 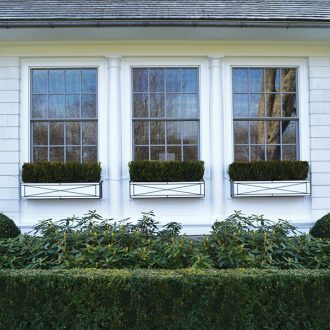 She’s filled the black window boxes with a white fitted planter and classic evergreen Buxus for a very stylish yet understated effect.